The sun is shining again in Northern California. This crazy weather is so bazaar. I'm so excited to show you my latest project. I set aside a whole day to make this delicious pastry. I found this adorable angel vase at the thrift store,and I knew it would be a perfect vase to hold my Camellia blooms. According to Bettys blog the history of the Macaroon is an interesting story. The origins of these delicacies can actually be traced back to an Italian monastery in 1792. As befits something made from a simple paste of sugar, almonds and free-range egg whites, macaroons take their name from the Italian word for 'paste' - 'maccarone'. Although Italy was its birthplace, it was the French who made the macaroon truly famous. The pink depression bowl holds some of the delicate, light and crisp pastries. A soft pink hankie from my mother's handkerchief collection. So dear to my heart. 'Pink Perfection' is the delicate looking Camellia...With the single petals and the most beautiful pink color. I have my french pillows on the swing and my favorite pink and white tea pot for tea. The dainty pink tea cup I bought at the antique store a couple of months ago. The tea cup is by Noritake-hand painted - made in Japan. I have always had the desire to make these beautiful cookies. Thank you once more for joining me on my journey to a Joyous Way of Life in Retirement. I would love to thank all of you for your wonderful comments. They are truly heartfelt and I love to read each and every one of them. Betty, you are so talented! I just love to see your pretty garden and your lovely vignettes!! My mother-in-law has a pink camellia bush, and I was just telling my hubby that I'd like for us to plant one. Yours is just breathtaking -- one of the prettiest I've seen. Visiting from Thursday Favorites Blog Hop; have a wonderful evening. 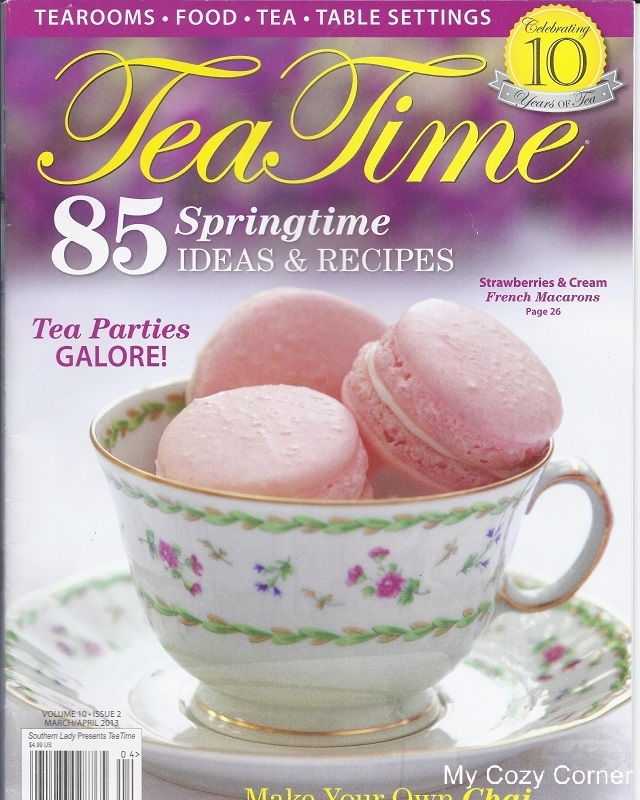 Tea Time has inspired me many times but I haven't been brave enough to make the macarons yet. Perhaps when I'm fully recovered I will give them a try. They sure look good, Betty! I love your Camellia; such a gorgeous shade of pink! Your pink hankie, teapot, pink depression bowl, and teacup make for a lovely tea break. Thanks for sharing and enjoy your weekend. You knocked the macaroons out of the ball park - these are fantastic and look like they came fro Ladurees or some other terrific bakery! Oh my friend, first let me say I love your header, I am crazy for angels, love your garden angels! Now on to this lovely display of deliciousness. The tea pot, the cherub and the macaroons all look absolutely divine! Thank you for sharing at the Thursday Favorite Things hop big hugs! Sadly, I am like a magnet to sweets of late....these look delightful! I have thought about making macaroons but have yet to do it...this are my motivation...yum! I made them for the first time not long ago and they are not as hard as I imagined. Yours looks lovely and I bet they tasted divine! What beautiful macaroons you made! I wish I could taste one right now. Your sweet vase is darling with your pretty camellias. The teacup was a special find! These have been on my bucket list for a while. The cream cheese sounds better than butter cream. I think the camellia is the most perfect flower ever created. I was almost inspired to try macaroons until I saw the 5 hours of prep time. They look wonderful though! Your camellias are gorgeous! I love macaroons. I had no idea it took five hours, but I'd be tempted to make them if mine turned out half as good as yours. Your camellias are breathtaking, and I love your tea table. I'm linking this post to Rattlebridge's Facebook page, Tweeting and pinning. Betty, have a great weekend. Oh Betty these macaroons are beautiful. I am going to take these on one day. All of your photos were so beautiful I wanted to jump into each one!! I love macarons! And I didn't know they were born in my country! Thank you for this news! Everything looks so beautiful. The macaroons, the soft pinks of your pretty dishes, and the wonderful camellias from your garden truly make a cozy setting. I'm so happy our Northern CA weather has settled a bit. That wind earlier this week was crazy! I would love to learn how to make these! Was the recipe very difficult? I think you created a masterpiece and you would rival any pastry chef! The recipe is very long. The time to prepare the pastry is three hours and another two hours before the macaroons hit the oven. I loved the experience and maybe do them again for a tea party. Thank you so much for your beautiful comment. Actually the result is only 12 macaroons. The recipe is for 24 halves. I wish you happy baking. French macaroons are great to have around. i like your arrangements. 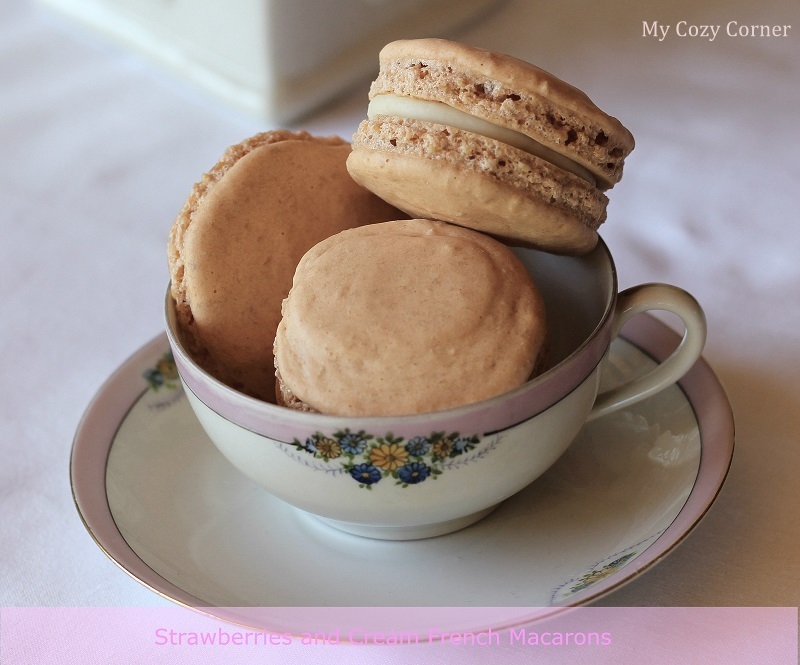 Being the Francophile I am, macarons are one of the delicacies on my "learn to bake" list. These are just stunning -- your first time? You rock! And they look very beautiful, designed as you have the setting! Splendid! Happy Spring. Oh, my - is that a beautiful presentation or what!! 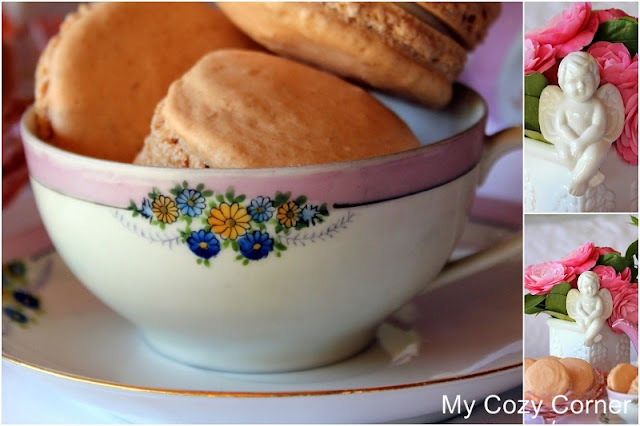 Those camellias are stunning and look wonderful, as a backdrop for the yummy looking macaroons! Just the name of them makes me want to run to the kitchen and start baking. Thank you for sharing! Oh my word, what a lovely and sweet post! I love your small setting, with those yummy macaroons, (Italian cookies!!) and your teapot is gorgeous too! Your mom's hankie is a real treasure, honey. Thank you for popping by to see my new teapot. Have a happy week. I have to try your macaroons! My camelias are in bloom today and yours look lovely in the cheub vase!